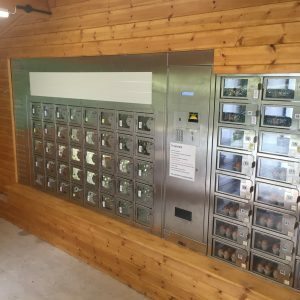 A Unique new vending machine installed on a Herefordshire farm is giving people access to fresh farm produce- including eggs and soft fruit 24 hours a day. The Parker family installed the machine at home at Instone Court, Munderfiled near Bromyard and has increased farm gate sales exponentially. Simon Parker who farms more than 250 acres of apples, hops, laying hens and grassland with his wife Elaine and father Barry, says the vending machine has resulted in a “significant lift” in direct sales and enabled the family to offer a wider range of produce than before. “The vending machine offers both chilled and ambient temperature storage for produce, which has meant we can increase the range of produce we are selling. The first few months have been highly successful, with a wide range of produce on offer, including eggs, strawberries, cherries, loganberries, raspberries, gooseberries and cordials. Although not all produce is from the family’s own farm, it is all sourced within a small radius of it and there are further plans for more seasonal crops, including cobnuts and a wide range of apples, later in the year.